The Vagrant - ZineWiki - the history and culture of zines, independent media and the small press. 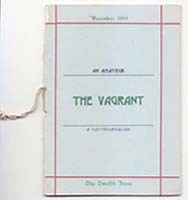 The Vagrant was an amateur press publication published and edited by W. Paul Cook. The Vagrant was published from 1915 to 1927. The publishing schedule was fairly erratic: issue #2 appeared in March 1916, #3 in June 1916, #4 in September 1916, #5 in June 1917, #6 in November 1917, #8 in July 1918, #9 in September 1919, #11 in November 1919, #12 in December 1919, #13 in May 1920, #14 in March 1922, and the final issue, #15, in Spring 1927. W. Paul Cook was a member of the United Amateur Press Association and a staunch supporter of the amateur press. Contributors to The Vagrant included A. M. Adams, May Arthur, John Osmon Baldwin, Clara L. Bell, Chas S. Campbell, Paul J. Campbell, William J. Clemence, O. Byron Copper, Anna Helen Crofts, Geo W. Darragh, Lucy Frost, Elsa Gidlow (Les Mouches Fantastiques), Arthur Henry Goodenough, Alma Myrtle Greenfield, Jean Connell Hayes, Edna von der Heide (The Inspiration), J.E. Hoag, Willis Edwin Hurd, Winifred Virginia Jordan (The United Co-Operative), Anita Roberta Kirksey, Franklin K. Lane, Andrew F. Lockhart, H. P. Lovecraft, Samuel Loveman, Martha Charlotte Macatee, Pearl K. Merritt, Roswell George Mills (Les Mouches Fantastiques), Edith Miniter (The Aftermath), Dora Hepner Moitoret, Mabel I. More, James F. Morton, Jr., Essilyn Dale Nichols, Olive G. Owen, James Larkin Pearson, George W. Priest, Geo I. Putman, Robert D. Roosmale-Cocq, Harriet L. Trieloff, Litta L. Voelchert, Charles L.H. Wagner, and Henry G. Wehking. W, Paul Cook was partial to work inclined toward the supernatural. After reading H. P. Lovecraft's juvenalia in 1917, Cook encouraged Lovecraft to continue writing fiction. Many of his works were published for the first time in The Vagrant, including "Dagon", for which Cook wrote the critical introduction, "Howard P. Lovecraft's Fiction" (#11, November 1919). The Vagrant also published work by Lovecraft collaborators Anna Helen Crofts and Winifred Virginia Jordan (nee Jackson) (as herself and as 'Elizabeth Berkeley'). W. Paul Cook was one of the publishers, along with H. P. Lovecraft, Winifred V. Jackson, and others, of The United Co-Operative. Later in the 1940s he published The Ghost. Sean Donnelly provides an excellent account of Cook's life and work as an amateur printer in his book W. Paul Cook: The Wandering Life of a Yankee Printer (Hippocampus Press, 2007). This page was last modified on 13 December 2011, at 12:39.